MLB postseason 2016: Which team is favorite to win the playoffs? The regular MLB Season ended last Sunday, and the postseason opened this Tuesday and Wednesday with the AL and NL wild card games. There is so much excitement as we speak about the Major League Baseball playoffs. The first game of the World Series is scheduled for October 25, so now everyone’s thinking about who’s going to win. That’s what everyone wants to know, of course, and have been waiting for so many long but thrilling months. Last year’s World Series Champion Kansas City Royals didn’t make it in the playoffs this year. Neither did the Yankees, nor the Cardinals, which were very good teams in previous years. However, this year Chicago Cubs is the team that everyone is talking about as the winner of the MLB postseason. Yes, the Cubs are the favorite team to win the World Series, with Westgate odds of 7/4. Chicago Cubs is probably the strongest team if they will be the team they proved to be the entire regular season. 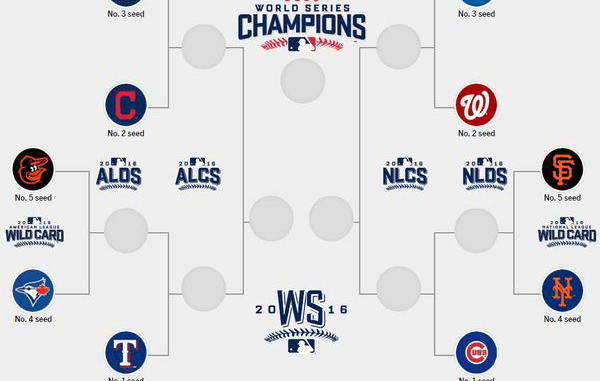 If the Cubs will get in the final, they will probably play against one of the two next favorites, Red Sox and Nationals. The second favorite to win the World Series is Boston Red Sox with Westgate odds of 6/1, and next Washington Nationals with Westgate odds of 7/1. Texas Rangers odds to win the title are 5/1 and Cleveland Indians, 14/1. The odds are against the teams playing the wild cards games. Baltimore Orioles and San Francisco Giants odds are both 25/1, New York Mets odds are 20/1 and Toronto Blue Jays 14/1. But this doesn’t mean the games won’t be fascinating. There is so much to see in the playoffs, and with the Cubs as winners or not, the postseason games are guaranteed to be very thrilling.